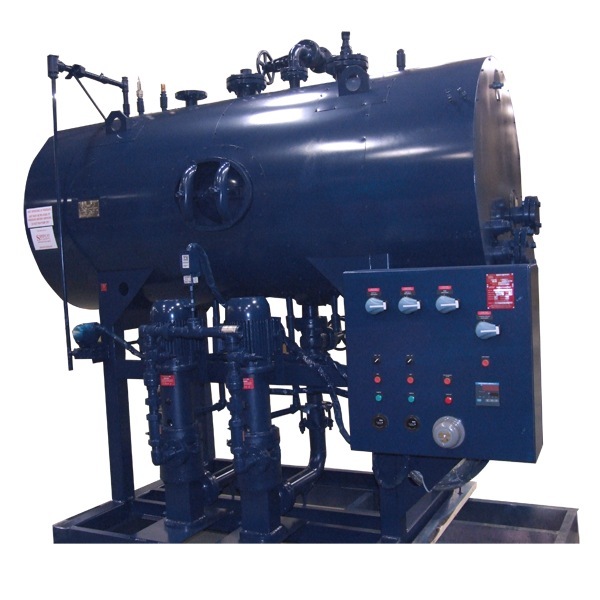 Thermal Tech, Inc. carries Boiler Feed Systems, Deaerators, Blow Down Systems, and Flash Tanks from Shipco Pumps. A Cylindrical Elevated Steel boiler feed unit for pumping water temperatures up 212°F (with Model P low NPSH pump). Unit equipped with standard, 3/16″ thick, black steel receiver; an option for heavier thickness is available. Receiver also can be 300 series stainless steel for maximum corrosion resistance; most receiver sizes can be epoxy-lined or plasite-lined. Standard receiver sizes range from 70 gallons to 1,468 gallons; customized receivers can be made for unique applications. Unit can handle a wide range of flows and pressures. An electrical solenoid make-up water valve with float switch control is standard. Units typically available in either simplex or duplex configurations; other configurations such as triplex or quadraplex available if needed. Pump motors can be either 1750 RPM or 3500 RPM, single or three phase. Unit equipped with bronze-fitted Model D (for temperatures 210°F or lower) or Model P pumps fitted with industry standard motors and with mechanical seals rated for temperatures up to 250°F. Higher temperature seals and special faces available upon request. Pumps can be mounted in either a vertical or horizontal orientation. Unit can also be equipped with bronze-fitted, multi-stage pumps for high-pressure applications; tungsten carbide mechanical seals on multi-stage pumps rated up to 300°F. A Steel Horizontal Elevated Make-up boiler feed unit for pumping water temperatures up 212°F (with Model P low NPSH pump). A standard, 3/16″ thick, black steel receiver is ASME code constructed with dished heads; tank can be ASME code stamped if needed. An option for heavier thickness is available. Receiver also can be 300 series stainless steel for maximum corrosion resistance; most receiver sizes can be epoxy-lined or plasite-lined. Standard receiver sizes range from 77 gallons and up; customized receivers can be made for unique applications. Unit can handle a wide range of flows and pressures. An electrical solenoid make-up water valve with float switch control is standard. Units typically available in either simplex or duplex configurations; other configurations such as triplex or quadraplex available if needed. Pump motors can be either 1750 RPM or 3500 RPM, single or three phase. Unit equipped with bronze-fitted Model D or Model P pumps fitted with industry standard motors and with mechanical seals rated for temperatures up to 250°F. Higher temperature seals and special faces available upon request. Pumps can be mounted in either a vertical or horizontal orientation. Unit can also be equipped with bronze-fitted, multi-stage pumps for high-pressure applications; tungsten carbide mechanical seals on multi-stage pumps rated up to 300°F. 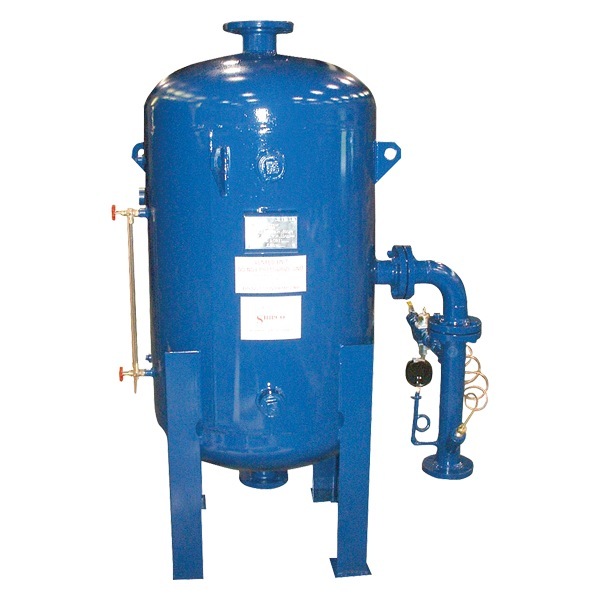 Type .005 DA-IST atmospheric deaerators are recommended for high-pressure boiler applications. Unit equipped with internal spray-tray design. The standard .005 design removes dissolved oxygen to a maximum level of .005 cubic centimeters per liter of feed water. The atmospheric deaerator design provides unrestricted venting of the non-condensing gases, allows for gravity returns, and generally produces less steam loss under partial load conditions than a pressurized deaerator. Unit designed so that undeaerated water only comes in contact with stainless steel to prolong life of unit. The amount of hot condensate returns influences which design is most appropriate for applications. A single-tank design (DA-IST) is typically used on systems having 80% or more make-up water. A two-tank design (DA-IST-2T) that includes a standalone surge tank is typically used on systems having more than 20% return hot condensate. 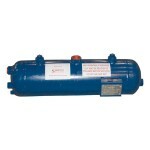 Standard deaerator receivers available in black steel. For two-tank designs, the surge tank can be either plasite-lined or made 300 series stainless steel. Unit can be built to handle a wide range of flows and pressures; receiver can be customized in terms of diameter, length and height to meet job specific requirements. Number of pumps on unit depends upon number of boilers to be supported and stand-by specifications. Pump motors can be either 1750 RPM or 3500 RPM, single or three phase. Unit equipped with single stage or multi-stage pumps depending upon operating conditions. Pumps bronze-fitted with industry standard motors and mechanical seals rated for temperatures up to 300°F. Higher temperature seals and special faces available upon request. Pumps can be mounted in either a vertical or horizontal orientation. 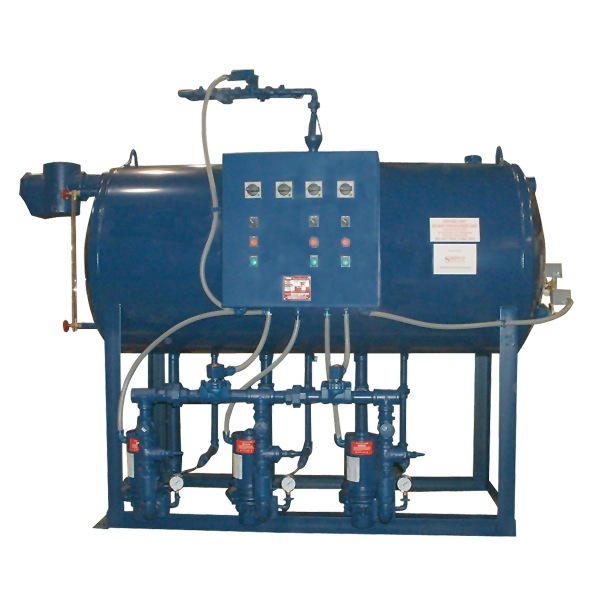 Deaerators equipped with direct steam injection assembly with stainless steel preheat tube; assembly includes temperature regulator that can be either pneumatic controlled or self-contained. Other accessories include but not limited to gauge glass assembly thermometer, inlet strainer, butterfly isolation valve, low-water cut-off or alarm switch, electrical control panels and tank insulation. 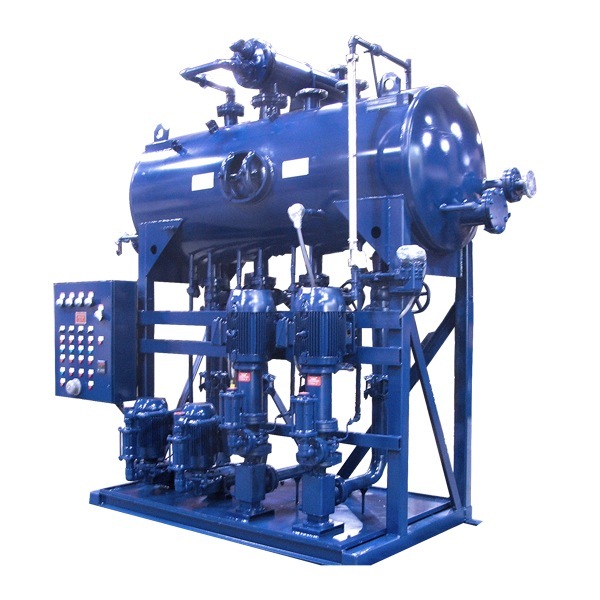 Type .005 DA-ISTP pressurized deaerators are recommended for high-pressure boiler applications. Unit equipped with internal spray-tray design. The standard .005 design removes dissolved oxygen to a maximum level of .005 cubic centimeters per liter of feed water. Unit designed so that undeaerated water only comes in contact with stainless steel to prolong life of unit. The amount of hot condensate returns influences which design is most appropriate for applications. A single-tank design (DA-ISTP) is typically used on systems having 80% or more make-up water. A two-tank design (DA-ISTP-2T) that includes a standalone surge tank is typically used on systems having more than 20% return hot condensate. Standard deaerator receiver available in black steel and ASME code stamped with an extra corrosion allowance of 1/16″ beyond ASME code requirements added. For two-tank designs, the surge tank can be either plasite-lined or made 300 series stainless steel. Unit can be built to handle a wide range of flows and pressures; receiver can be customized in terms of diameter, length and height to meet job specific requirements. Number of pumps on unit depends upon number of boilers to be supported and stand-by specifications. Pump motors can be either 1750 RPM or 3500 RPM, single or three phase. Unit equipped with single stage or multi-stage pumps depending upon operating conditions. Pumps bronze-fitted with industry standard motors and mechanical seals rated for temperatures up to 300°F. Special faces available on seals upon request. Pumps can be mounted in either a vertical or horizontal orientation. 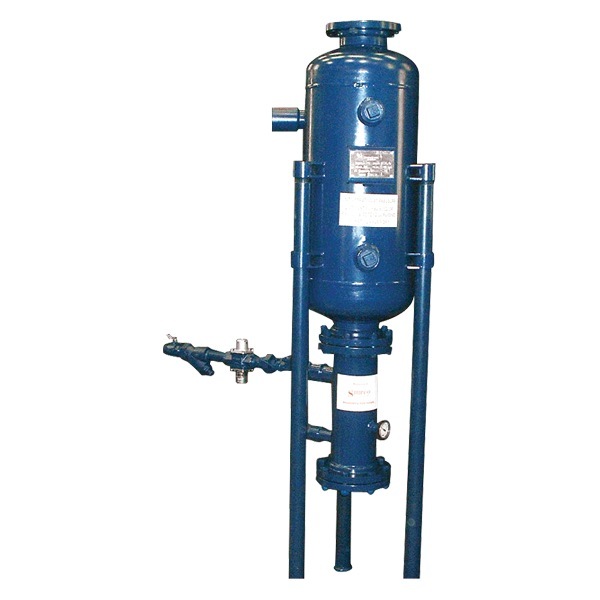 Deaerator equipped with direct steam injection assembly with stainless steel preheat tube; assembly includes pressure regulator that is self-contained. Other accessories include but not limited to gauge glass assembly thermometer, inlet strainer, butterfly isolation valve, low-water cut-off or alarm switch, electrical control panels and tank insulation. 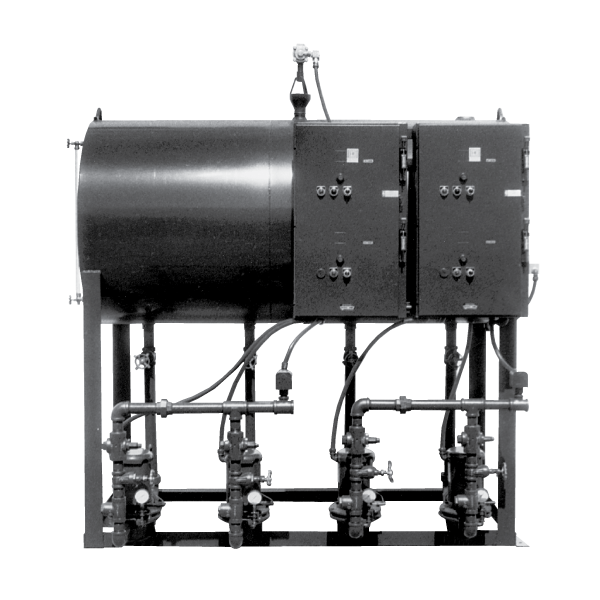 Vertical Flash Tanks,Horizontal Flash Tanks, or Flash Recovery Vessels are used to reduce high-pressure steam to a low-pressure state before returning the steam in your system. Tanks can be built with a horizontal or vertical orientation with a stand. Horizontal design is available without a stand for hanging. Tanks made of heavy-duty steel and designed up to 150 psig with national board stamp as standard; other ASME stamped ratings available upon request. Various sizes available. 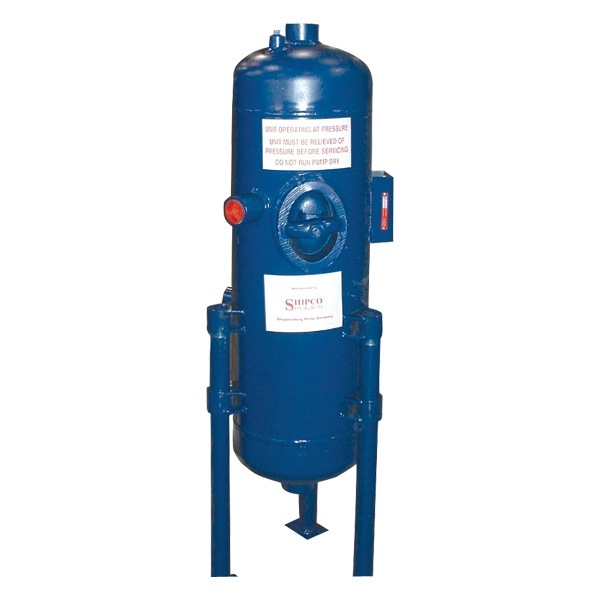 A Blowdown Separator reduces the boiler blowdown water (along with chemicals and dirt) to atmospheric pressure and cools its temperature before being piped into a drain. Tanks can be built as vertical orientation with stand. Tanks made of heavy-duty steel with stainless steel wear plates and designed to 150 or 300 psig with national board stamp. An optional manual or automatic after cooler is available. Various sizes are available. These vessels provide an alternate way of cooling the bottom boiler blowdown. Blowdown Tanks (BDT) are ASME code stamped for 150 psig (minimum 5/16″ thick). The tank is designed to break up the blowdown flow by hitting the tangential stainless steel wear plate in the vessel. Unit can be fitted with optional after cooler. Various sizes and shapes are available to meet your specifications. 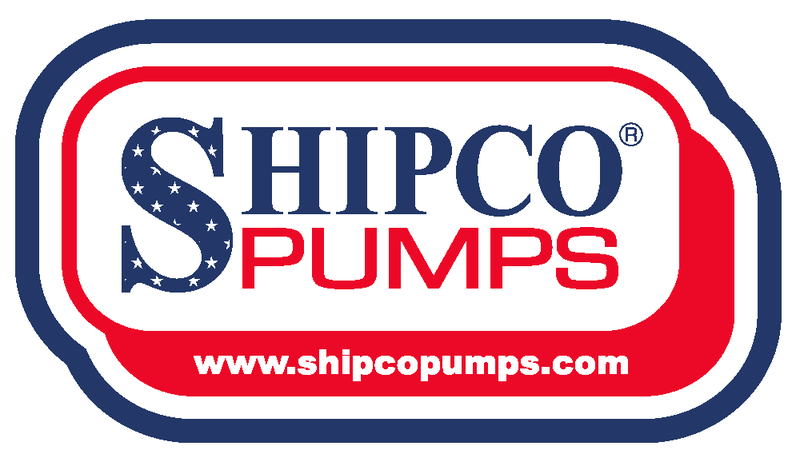 The Shipco website has a variety of tools including Product Slectors, MathWizard™ Calculators and the VirtualPump™ and Steam Glossary. VirtualPump™ is a collection of animated pump and unit simulations, created as a learning tool to help people acquire an understanding of how many of the major products within the steam industry function.